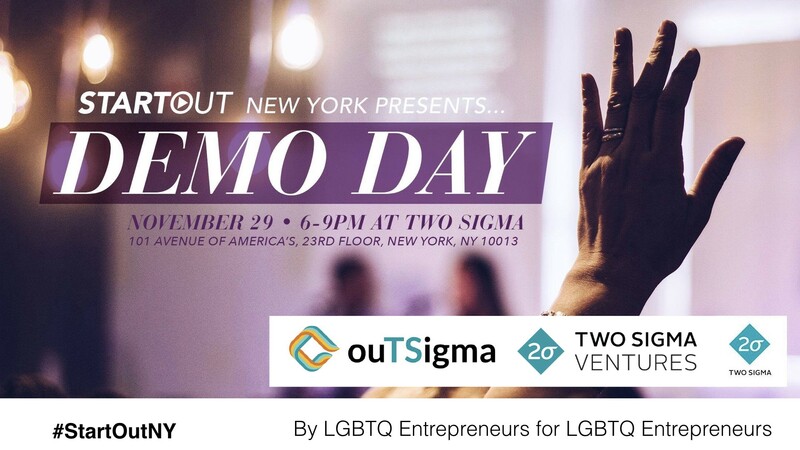 This year’s Demo Day at Two Sigma showcased some of the most innovative LGBTQ-led startups from the StartOut community. Operating in sectors ranging from access to fresh food, restaurant operations, healthcare to shopping and a few more in between. Our judging panel was made up of top venture capitalists, angel investors and for the first time included representatives from two large brands — Coach and L’Oréal, to really give some solid feedback. The top three startups selected were: Catherine Hofmann, qspaceshealth.co; the runner up, Alexander Hughes, dolphinai.com and the winner of most exciting startup was Tim Wikstrom, presentr.me congratulations to all. 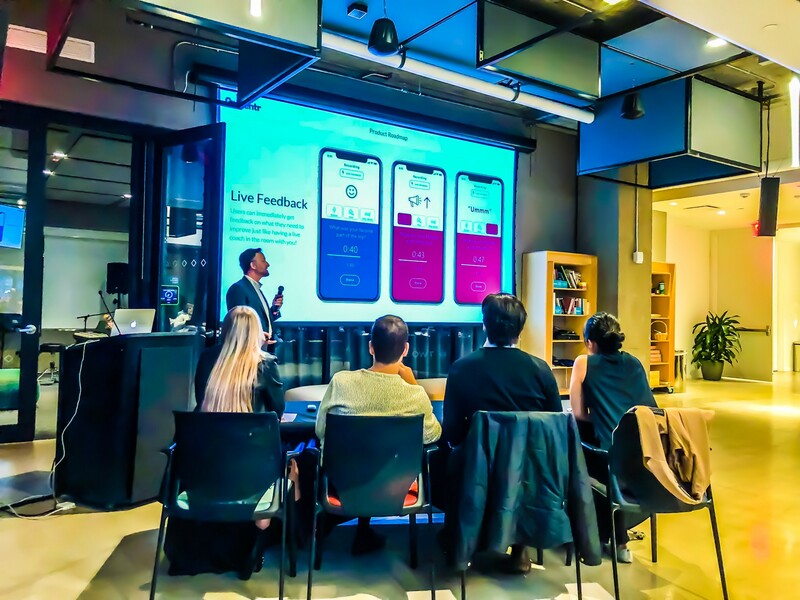 Presentr — Mobile app that helps people share their ideas with passion and confidence through real time automated feedback on their presentation skills. DolphinAI — Software with integrated computer vision algorithms to analyze aerial imagery from drones, satellites, planes for P&C insurance companies to use for claims processing and underwriting. 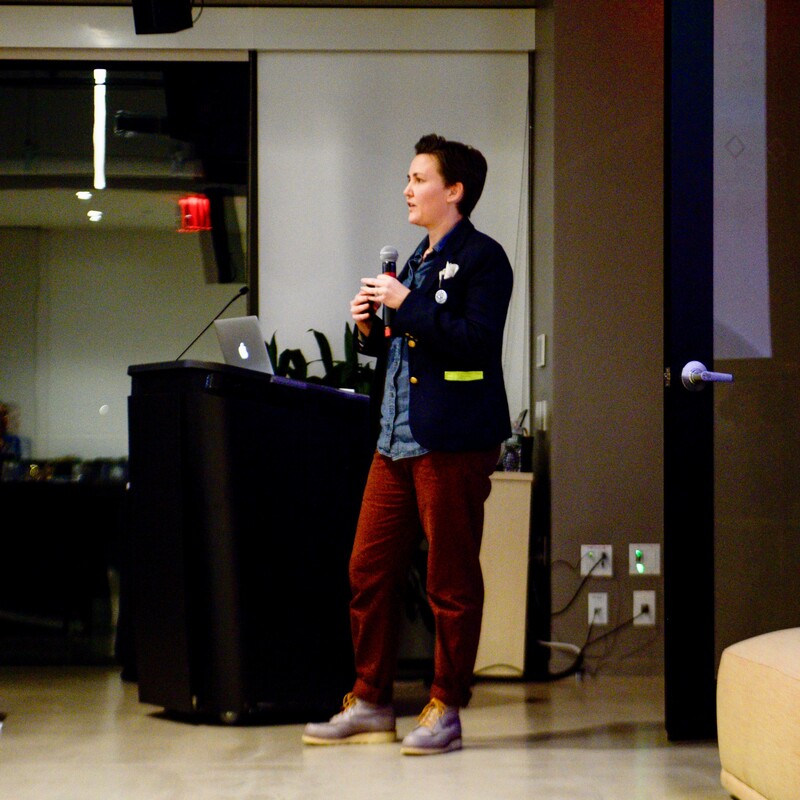 QSpaces — Transforming LGBTQ healthcare by sharing community-sourced ratings and reviews to connect LGBTQ patients with great health and wellness providers. 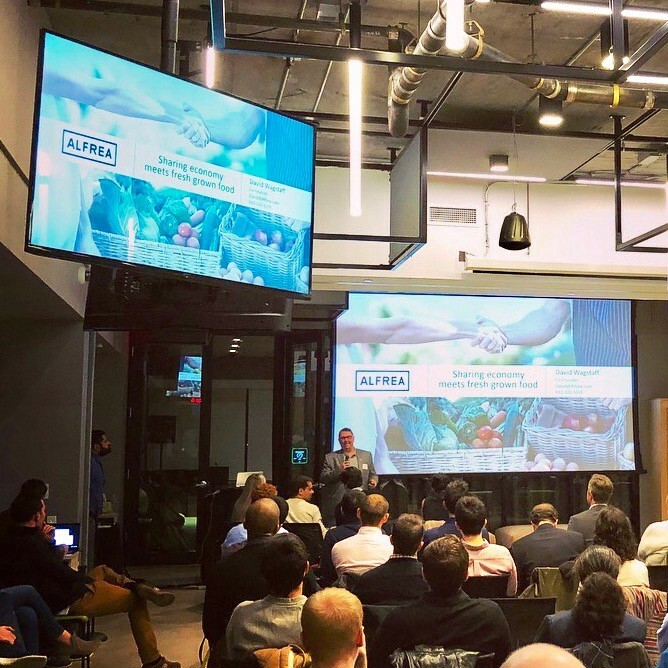 Alfrea — Grow, eat and enjoy fresh grown food as employee benefit. Food choices are 50% of the $3.4 trillion in healthcare costs. We make behavioral change fun. Translator — Innovative tech solutions to help companies and organizations implement, scale, and measure Diversity & Inclusion efforts. Caper — Delivering an online shopping experience to physical stores in an affordable, profitable manner for owners, and smooth and faster for customers. HiCommerce — Mobile app that connects customers with local boutiques in NYC. 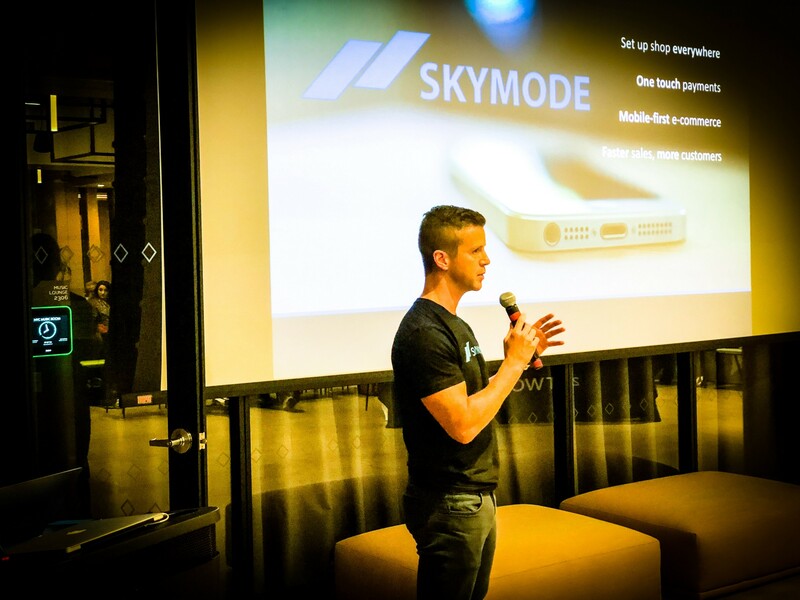 SkyMode — Mobile e-commerce platform enables brands to engage and transact directly with consumers through one touch offers that increase conversion rates by 3x. 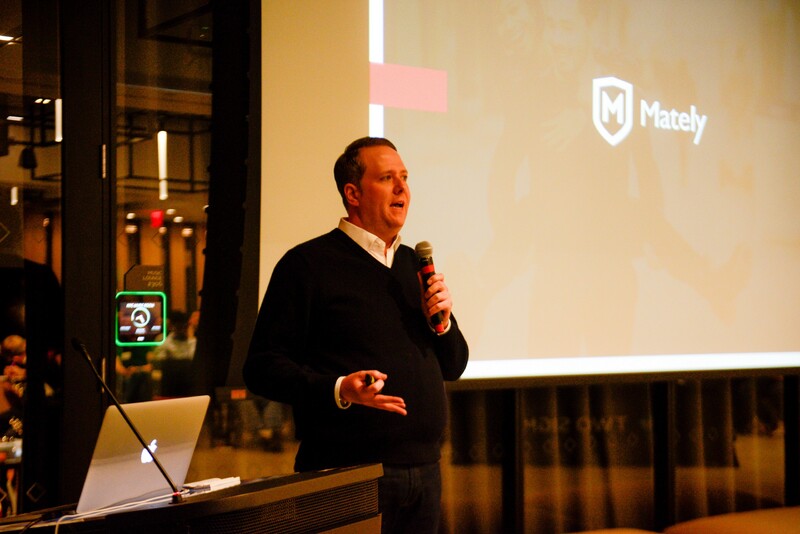 Mately — Mately tests its members for STDs and enables them to share their results with others when using online dating sites and apps. Presentr is addressing one of the biggest challenges millions of people face on a daily basis: public speaking. Whether at a business meeting, pitching your business, giving a talk to your team or in school, we are all expected to share our ideas with confidence and passion. The reality is, few people have the ability to do this effectively. And, there are 30 million power point presentations delivered daily which means we all suffer when people cannot share their ideas effectively. That’s why we developed Presentr, an automated Ai coaching app that allows users to receive a quantifiable score on their presentation skills, practice and get real-time, automated and quantifiable feedback. They get tips on how to improve their skills and they can play interactive games to help themselves improve so they feel more confident. We bring 20 years of training, coaching and subject matter expertise to this business and have already introduced the app to over two dozen organizations including Pfizer, Novartis, Cisco, Latham & Watkins and Boston University. We are a b2b solution and we are approaching the market through direct sales and a network of distribution partners. Presentr launched in April of 2014 and we have attained $1M in revenue through 2016 using Presentr at events such as sales meetings and national speaker training meetings. We launched our iOS product in Q4 of 2017. Dolphin AI — Software with integrated computer vision algorithms to analyze aerial imagery from drones, satellites, planes for P&C insurance companies to use for claims processing and underwriting. Partners Nic and Catherine moved to Philadelphia in 2015 and had a hard time finding doctors they could trust, and they weren’t the only ones. More than 50% of lesbian, gay, and bisexual people have experienced discrimination in healthcare, and for trans people that number jumps to 70%. Currently, the LGBT community uses personal referrals and chat rooms like private Facebook groups to search and solicit information. It’s time consuming, hard to search, and requires making private information very public. What if there was a HealthGrades or Yelp exclusively for the LGBTQ community? Well, Jefferson Innovation gave us $10,000 to find out. QSPACEShealth.com is a public beta currently open to users with Pennsylvania zip codes. We’ve been well received by local and national press, LGBTQ organizations, and healthcare systems alike. QSPACEShealth.com does not charge any fees to the LGBTQ community. Instead, health and wellness providers will be charged a subscription fee to claim and enhance their profile, leverage additional information and features to attract new LGBTQ clients. HealthGrades and ZocDoc both use this model, except we’re expanding it to all health and wellness providers and not just medical providers. And the LGBTQ market is underserved because real and perceived discrimination keeps the LGBTQ communities from visiting doctors. Imagine how many more LGBTQ people would go to the doctors if they did not fear discrimination! We can capture 9% of the provider market (12 MM total) and 30% of the LGBTQ community (15–23 MM total) if we have the funds to power dev, marketing, and customer acquisition. QSPACES is looking for investors to help us build our revenue streams and capture the Philadelphia market to prove traction and get us to the next level. We’re queer, we’re agile, and we’re in a space without any clear competition. Let’s go! Customer Traction: +150,000 providers in database for Pennsylvania, +250 registered users, picked up by 17 publications + podcasts — local and national. My parents are age 93 and 87. As they have gotten older I’ve been responsible for managing their farm and aspects of their health from 3 hours away. It’s not easy to find people to work or rent the farm. We tried a sign by the road and craigslist but neither seemed like the right solution. At the same time I had nephews and nieces that wanted Land to grow food but community gardens were sold out. Alfrea was started as an AirBnB for the farm or garden. While we succeeded at attracting customers, doubling every 6 to 8 weeks, we found commercial enterprises were willing to pay for what Alfrea offered as an employee benefit. This pivot in marketing strategy is allowing us to gain revenue faster and scale faster. We launched just over a year ago and have over 750 subscribers in addition to 8 commercial businesses locations that we are servicing. Three of these are hospitals in addition to two other medical facilities. They understand the connection between Health and food choices. Restaurant Reason — SaaS platform for full-service restaurants to deliver the most effective staff training and increase profitability. In 2013, I had under my belt thirteen years of restaurant hospitality training experience. As the Service Director of Union Square Hospitality Group’s Maialino, naturally I was in charge of training for the service team. However, with three meal periods, being open 365 days of the year, and having as many as 55 Front of House employees to train, it was impossible to deliver the quality of training I knew I could, if I just had a better system and more time. I assumed that, because we had iPhones and Elon Musk, someone must have created software that would allow me to effectively manage the food and beverage information in my training materials. I was wrong. The Learning Management Systems (LMS) that existed didn’t help me manage daily operations, treated training like an academic process not based in the realities of running a restaurant, and were way too expensive for my single restaurant. In my search for a solution, it just so happened that a friend of mine from college had created a program called Restaurant Reason that was a sort of flash card study system for servers. I asked him to come to the restaurant so I could learn more. While it wasn’t exactly what I needed, I told him that if he could build the tools I knew we specifically needed, he’d be able to market the product to other restaurants because we were all struggling with the same issues. I left Maialino later that year, invested in Restaurant Reason, continued to pilot the product with Maialino, and eventually took control of the company. We secured our first three paying clients in 2014, including Maialino — who is still on the platform to this day. What started as a practical solution to a relatively simple problem has blossomed into a software business that has immense implications for the Hospitality Industry. I incorrectly assumed the problem was that we, managers and trainers, just didn’t have the tools or time… so I built a tool that optimized the workflow for managers, allowing them to deliver more effective training and increase profitability. However, as it would turn out, not only were we lacking the tools and time, we many also don’t have the expertise in training and development, talent management, employer branding, and more ancillary skills that impact profitability… so that is what we are working towards building now: a tool that provides built-in training and communications best practices for full-service restaurants to apply immediately into their operation, regardless of the professional experience of the administrator. During this time, I’ve also learned a lot about who our target really is, what makes a client a good fit or not. Moving forward, we are guided by a specific set of operational and cultural markers that have come to be helpful in identifying which is which. In terms of growth, we expect to rapidly scale with our first round of funding, focusing efforts on multi-unit, multi-concept operators. These are companies that operate multiple restaurants within a single corporate structure or with shared corporate resources, but each business is nuanced. Despite being part of the same family of restaurants, sharing a culture and an identity, the cross-brand messaging to the employees is missing from training. These kinds of companies will benefit from a singular channel for disseminating their corporate information across the different units, and each unit will benefit from the optimized workflow the tools create. Zooming out, there is an extremely fractured multitude of information that drives the food and beverage industry. Our goal is to streamline and automate the addition of new items to the menu; so that, for example, when a new cocktail is added to a restaurant’s Restaurant Reason site, simply typing the name of the ingredients will automatically tag and display information that we have collected and curated. The opportunity to partner with holding companies such as Diageo ($71B Portfolio) and Pernod-Ricart ($51B)* would allow brands to transmit their message in an authentic way via the employee selling their products, essentially creating brand advocates without the spend on manpower. Restaurants would deliver significantly better information than copy-and-pasted marketing materials or Wikipedia articles (which is what is being used today) and empower their sales-focused employees to build trust among the guests. Furthermore, there are opportunities to help develop a stronger community of restaurant professionals, as our industry continues to advance and become more of a viable career choice than ever before. Restaurants are typically slow on Sundays, Mondays, and Tuesdays, which means the staff enjoy their “weekend” on these off-nights. We can provide a direct connection to available restaurant staff, advertising Industry Night specials within a tech-ecosystem they are already intimately engaged with (because they engage with it for new-hire and continuing training in their restaurants). Restaurants will benefit from the additional sales on underperforming days. Industry professionals can enjoy their nights off amongst like-minded people and organically network (as opposed to networking events which are often forced). The advertising and revenue sharing potential is strong when we look at the number of businesses and employees available in almost any market. Over 3000 employees have used our system to date, with more than 950+ active users at restaurants that include Red Farm, Empellon, Maialino, North End Grill, and Craveable Hospitality Group, in Colorado, Connecticut, and New York. Our CEO and Founder is a 2X venture backed, openly transgender B2B / HRTech entrepreneur with a recent exit. Translator was founded based on her experience coming out as a transgender woman and the company’s mission is to spread empathy and equality at scale. The company is capital efficient, has two strong “MVP” products in market with very positive initial client feedback, and is looking to for new capital to invest in basic infrastructure to take scale to the next level. Since launch in Jan 2017, we have closed 9 major service / product clients all at varying stages of maturity including Viacom, NBCUniversal, Venture For America, Rag & Bone, NYC Dept. of Education, White & Case, and others. We have also developed a deep and qualified pipeline with warm access to top C-level executives including Starbucks, Coca-cola, Goldman Sachs, JPMorgan Chase, Citi, Microsoft, Salesforce, and many more… too many more!!! Caper — Delivering an online shopping experience to physical stores in an affordable, profitable manner for owners, and smooth, more comfortable, and faster for customers. Caper focuses on retail technology. Our desire to move faster and get things done inspired us to create the Caper Cart. 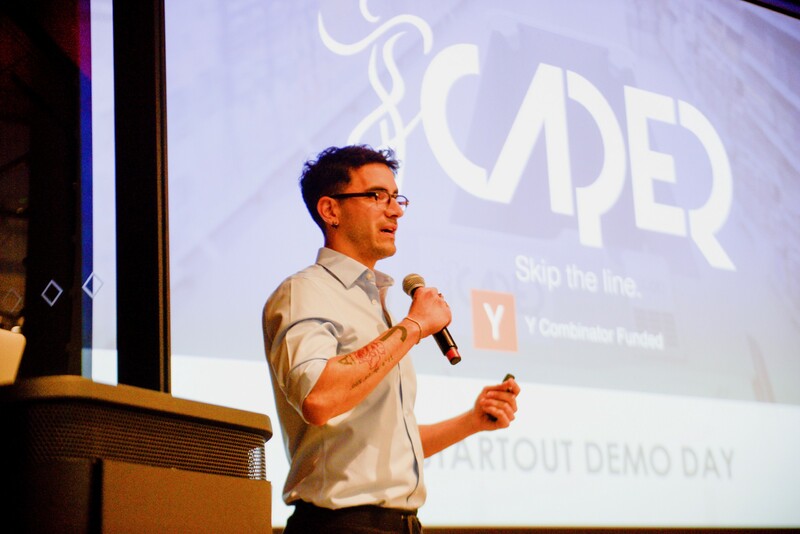 We were losing valuable time in crowded markets (you know the New York hustle) while waiting at lines (considering even current self-checkout solutions create lines), when we thought, “We need a way to make this process faster!” — Caper was born. Instead of pulling to the opposite side of retail we’ve merged the best of both worlds, creating an enhanced experience for customers and sales increase for grocers. The average person [in the US] spends two to five years waiting in lines and queues in a lifetime. We expect to cut that substantially, allowing customers more time to use it in what is truly important. We are ready to launch Caper. In New York, we have letters of intent and contracts signed with several grocers and supermarkets like Key Food, Foodcellar, Brooklyn Fare, Pioneer, Metfresh, and CTown, among others. In a Local Economy endangered by rising rents, big-box retailers, and the evolution of technology, we often forget about our neighborhood and the people who make it great. We developed Hi Commerce to (re)connect people with independent boutiques in the most convenient way possible. By engaging customers in meaningful conversation with boutiques across New York City, our goal is to fuse lost connections and help people discover products unlike any they have experienced before. Currently there are over 70 stores in NYC on our network. They all have the ability to connect with customers and respond to inquiries. Our team has substantial engineering, e-commerce and direct-to-consumer experience. We began developing V1 of the platform in 2013 and implemented our first food and beverage company in 2014. The following year we expanded our team and launched V2. We’ve continued to expand our team and roll out V2 features with the launch of V3 scheduled for 2018. We’ve processed over $27M in transactions and anticipate reaching $1B in processed e-commerce transactions within the next four years. With 8 clients, representing over 50 brands, using the platform we’re seeing dramatically higher conversion rates and acquisition of customer contact and payment profiles across all digital channels using SkyMode. Our current sales pipeline consists of 83 brands, representing $61B in annual e-commerce sales. On a weighted value basis this represents $275M/yr in potential processed transactions. Our processed transaction goal for 2018 is $156M. BBy was started by a doctor that wanted to increase breastmilk adoption rates and reduce preventable infant mortalities. By connecting parents who otherwise would not have met to buy and sell breast milk, BBy creates a community of parents committed to nurturing the future. Started as a grassroots movement in a handful of clinics in Chicago and now in three cities and growing, BBy is actively nurturing the next generation of humans. As a startup with an extremely diverse team of employees, BBy is an ally to parents nationwide regardless of ethnicity, race, gender, or sexual orientation. Currently in 3 cities with plans for 4 more in 2018 and a European Pilot in Q1 2018, BBy is also launching version 2.0 of our app which includes a store where curated infant needs can be bought and sold (with a commission to BBy). We’re poised to be the de facto name is breast milk in the coming years. 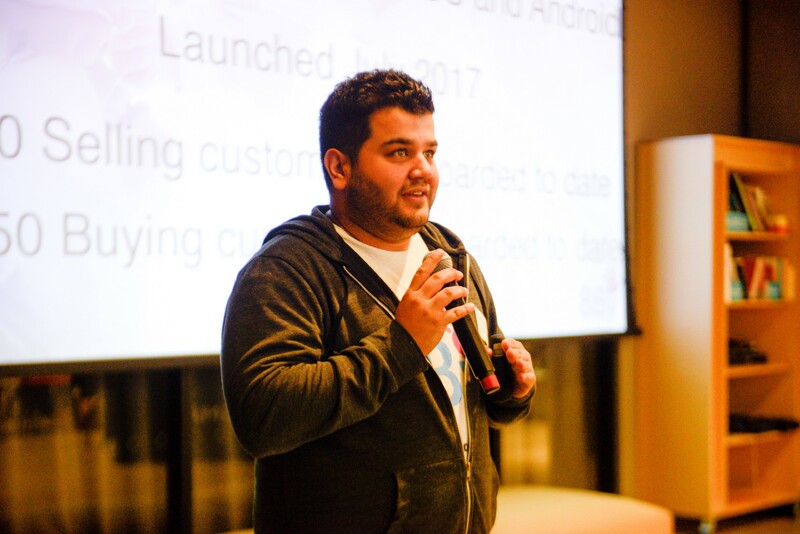 Erhan is an investor on the Two Sigma Ventures team and focuses on early-stage companies using advanced technology across different sectors. 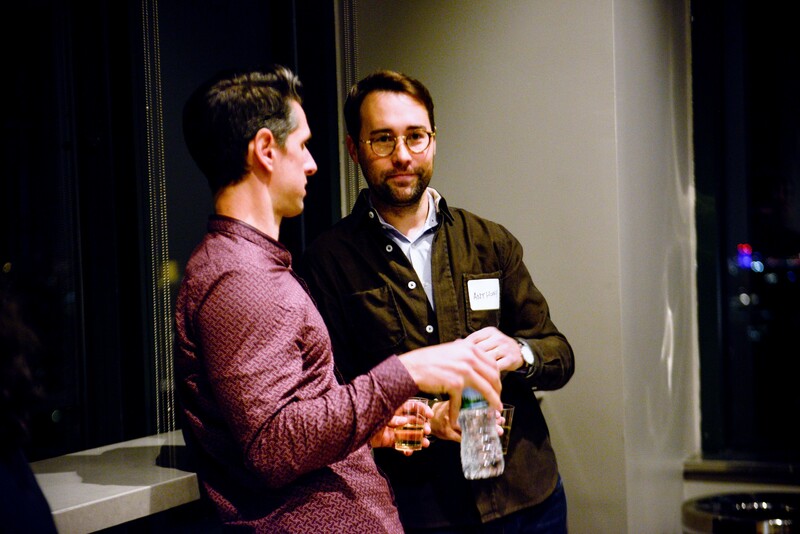 Prior to ffVC, Adam spent several years in business development, advisory and operational roles with several startups in New York and Los Angeles. Adam was the first hire at Lake Baldwin Management, a Princeton, New Jersey opportunistic hedge fund, where he was a generalist investor, managing an array of public and private market investments. Adam began his career at Goldman Sachs in the Leveraged Finance Group where he advised clients in the telecom and insurance industries, and in the Risk Markets Group, where he was involved in the design, structure and marketing of two of the early catastrophe risk-linked bonds. Brandon has past experience in finance, marketing, and entrepreneurship, and holds a degree in Communications from NYU. His most recent startup endeavor, Jozii.com, is a student based job matching service which amassed over 100,000 student users in the US. Other startup experiences include serving as a Financial Controller for a Bitcoin Exchange and a marketing consultant for companies building out campus brand marketing campaigns. In addition to launching his own start-ups, Brandon has taken the time to participate in various accelerator programs, including NYU’s Summer Launchpad. Even with his various commitments, Brandon has been dedicated to giving back to the University Entrepreneurship community, regularly speaking on Entrepreneurship as well as providing office hours to student start-ups at NYU, Penn State, USC, and Brown as well as serving as a judge for college pitch competitions which include Princeton’s Tiger Launch, Global Entrepreneurship Week and many more. As a member of the Quake team, Brandon handles University Relations, Deal Flow Generation, and Partnerships. 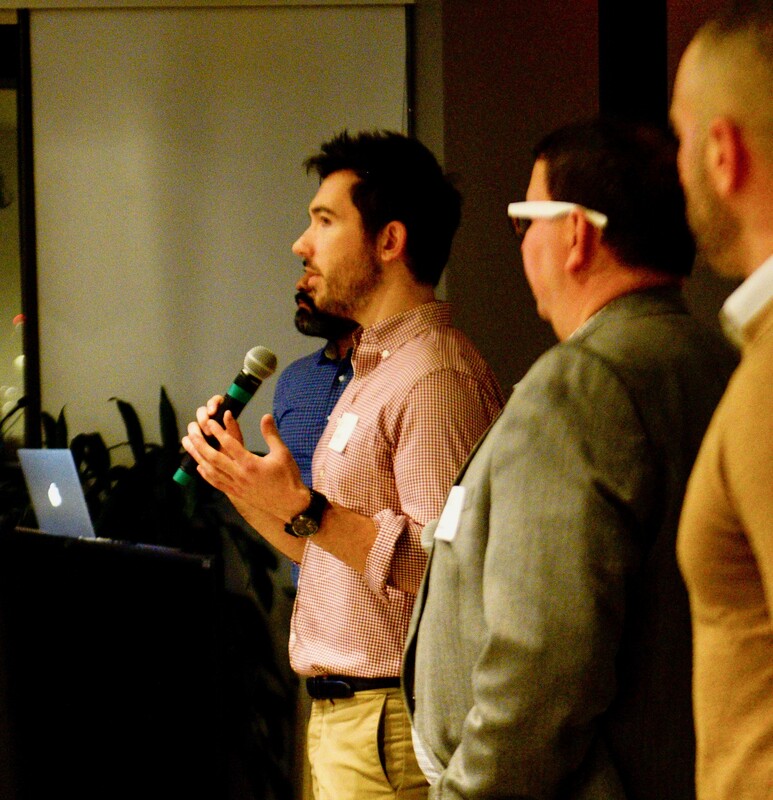 To date, UIS has connected with over 80 University Entrepreneurship programs across the world including Columbia, MIT, and other top-tier institutions, all of whom have participated in Quake’s University Investor Series Program. Alex is AVP of Digital Marketing and ecommerce at L’Oréal and has a lot of experience working with startups. In her prior role as the Director of eCommerce, Digital Marketing and CRM for Giorgio Armani Beauty at L’Oreal, Alexandra was in charge of crafting the brand’s eCommerce and interactive strategy across the US. Born and raised in Montreal, Quebec, Alexandra is now proud to call NYC her home. Dana Randall is the Head of Global Innovation at Coach. She has been listed by Digiday in The Glossy 50 recognizing the leaders creating change in fashion, luxury, beauty and tech. As well as named as one of Brand Innovators 40 Under 40 & Women to Watch. Rachael is responsible for the day to day sourcing in the consumer and tech sectors, with a particular interest in marketplace, B2C internet and data services businesses. Besides discovering new and interesting companies, she assists the team in conducting industry research and analysis and provides support for Stripes Group’s portfolio companies. Prior to joining Stripes Group, Rachael worked at Credit Suisse’s investment banking division in Hong Kong with the Equity and Debt Capital Markets Groups to support companies in their equity and debt financing plans. Previously, she also worked at IvyGate, an education startup in Hong Kong, as well as at Volition Capital, where she was responsible for supporting their efforts in sourcing B2B internet and SaaS companies. Rachael played rugby competitively for all 4 years of college, and loves watching a rowdy match on the pitch every now and then. She also enjoys hiking, cycling, and drinking an unreasonable amount of coffee. Chris is an early driving force behind StartOut and the Gaingels Syndicate. Currently focused in the tech/media publishing space at RebelMouse, Chris has wide ranging enterprise sales expertise that he brings to startups in the Gaingels and StartOut network. We imagine breakthroughs in the way the world approaches investment management, insurance and related fields by following the scientific method. Our engineers and modelers develop ideas backed by information and improved by iteration. Empowered by extraordinary computing power and vast amounts of data, we build sophisticated predictive models to realize progress. StartOut is a national 501(c)(3) nonprofit organization dedicated to fostering and developing entrepreneurship in the LGBT community. 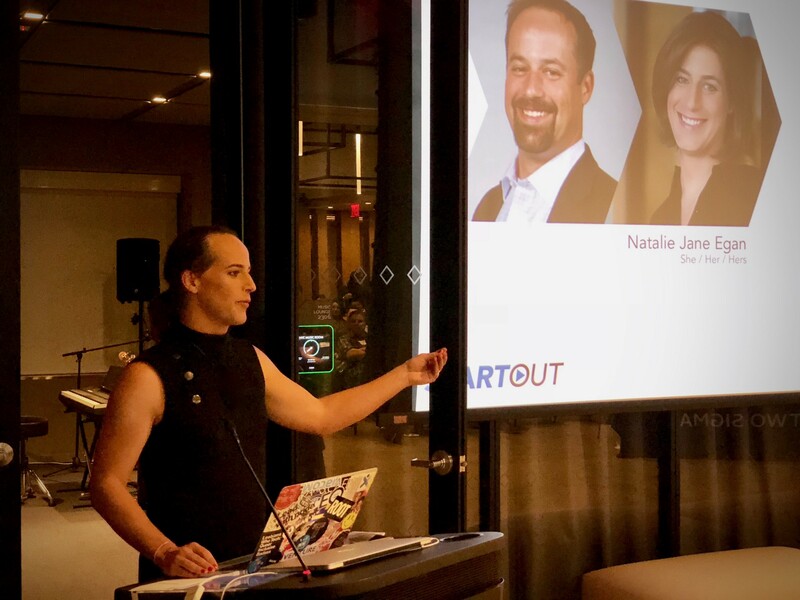 With over 60 annual events and a network of 15,000 strong nationwide, StartOut connects the entrepreneurial ecosystem, educates entrepreneurs on issues surrounding the business lifecycle and inspires the LGBT community by profiling out and successful founders. 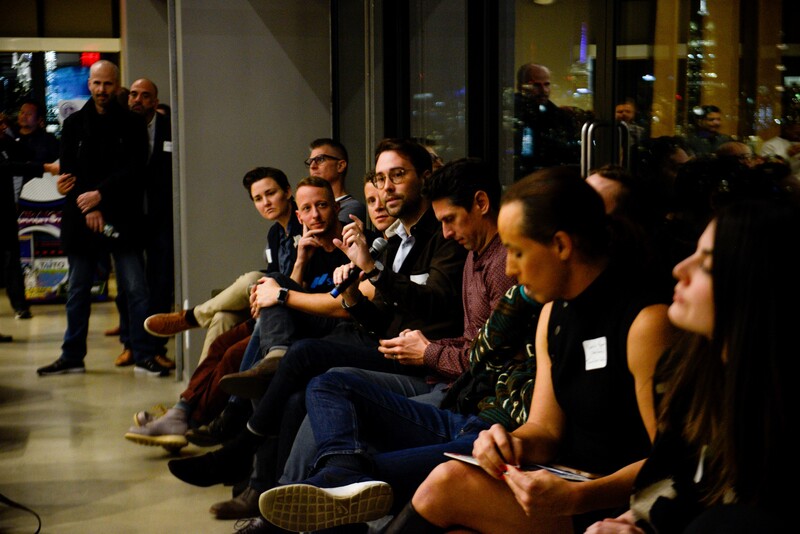 StartOut currently has chapters in San Francisco, New York, Austin, Boston, Chicago, Los Angeles, with Denver, Seattle, and many more on in development. Join today to grow your network — accelerate your business — empower yourself and the LGBTQ Community. Visit www.startout.org and follow @StartOut to learn more. 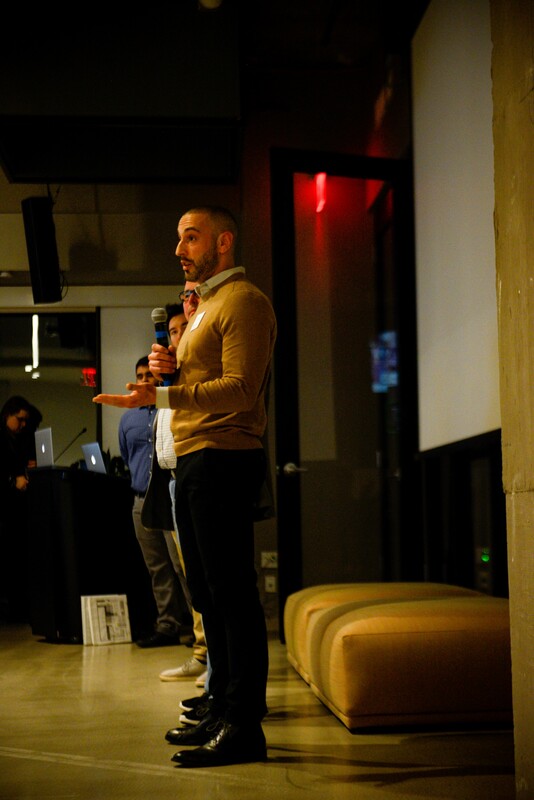 StartOut NY Demo Day was produced by Luke Sandler, Andy Saldaña, Adam Berlinsky-Schine and Wasim Ahmad.